Watch the video to get a sense of perspective about how truly alien Governor’s Island is. In the middle of New York City — literally, in the very middle of the 5 boroughs — there is a little island that most New Yorkers know nothing about. Within a couple hundred yards of the skyscrapers of Wall Street — and a couple hundred feet from the docks of Red Hook, Brooklyn (where I live) — there are hundreds of acres of open grassland, picturesque tree-lined thoroughfares, rows of yellow clapboard mansions and Victorian brick townhomes, a 9-hole golf course and a half dozen baseball diamonds, a panopticon-style prison, and an 18th-century fort complete with a moat. My father grew up here, on Governor’s Island, which was until the 1966 an active Army base (and a Coast Guard base until 1994). My grandfather, Lt. Col. John J. Fahey, was the Inspector General of the 1st Army, and he and his young family were stationed there in the mid and late 1950’s. My family has always spoken of Governor’s Island with a deep fondness — my grandmother especially would recall the ferry rides to Manhattan with my young father and uncle, and their visits to the big city from the idyllic quiet of their island home. 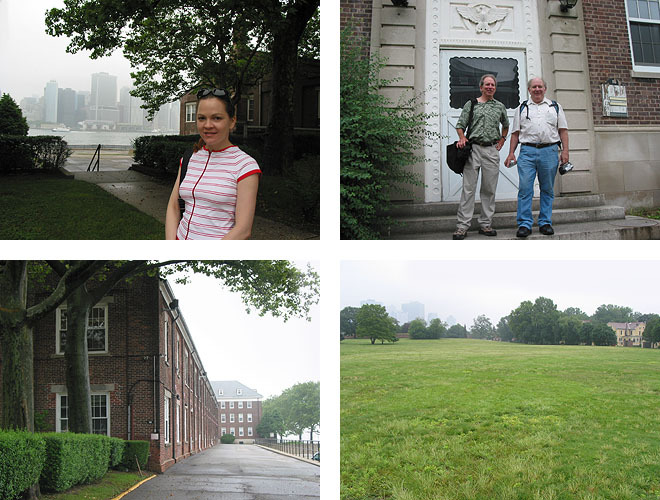 50 years later — last weekend — my father and uncle came to New York for an Army brats’ reunion visit to Governor’s Island, and we tagged along (and took lots of photos). It was a gloomy gray day, with forecasts for thunderstorms. Great weather for a boat trip! 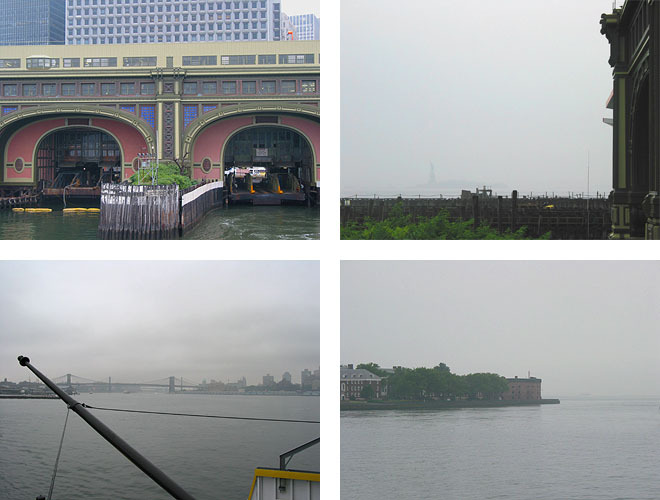 We took the ferry from the old beaux-arts iron terminal right next to the modern Staten Island Ferry terminal. The ferry ride takes only a few minutes, and the ferry itself has been in service since the 50’s, which means that my father used to ride it. Governor’s Island was called “Nut Island” by the Dutch who built their first settlement there. They let their livestock graze on the nearby Manhattan Island, but soon realized that Manhattan was a superior place for a permanent settlement, so they “bought” the island from the natives and moved just across the harbor … and the rest, as they say, is history. Walking around the island itself is like visiting an ivy league college campus during the summer recess, walking through a campus of red brick 19th century buildings, big and small, residential and official. We found the house where my father and uncle grew up — I can only wonder what was going through their heads as they stood on their old stoop. For 200 years, Governor’s Island was an active military installation, with thousands of people living and working there every day. 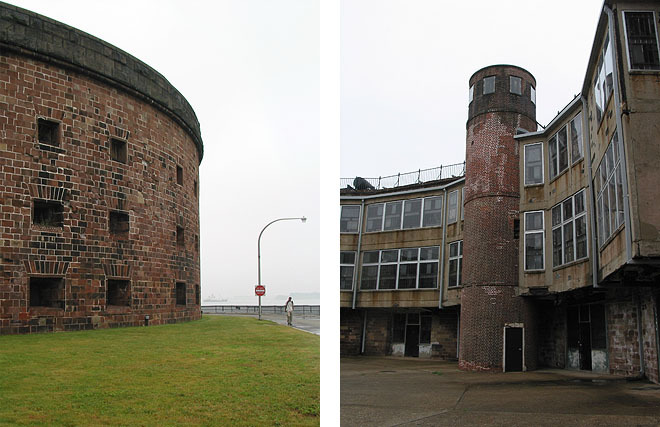 The cylindrical Castle Williams, with its Manhattan sister Castle Clinton, formed a powerful defense against naval attack. After the Civil War, the castle was transformed into a prison for Confederate POWs and, in modern times, for miscreant Army personnel. And in the center of the island, at the highest point, sits the star-shaped Fort Jay, a perfectly-preserved brick-and-earthworks fort built right after the Revolutionary War. Surrounded by a deep (dry) moat and defended by dozens of cannon emplacements, it’s easy to imagine how awful attacking such a facility would have been for the hapless soldiers approaching it. The fort’s interior, however, is a peaceful courtyard bounded by four quaint white-pillared collonades and shady porches perfect for sipping a mint julep. 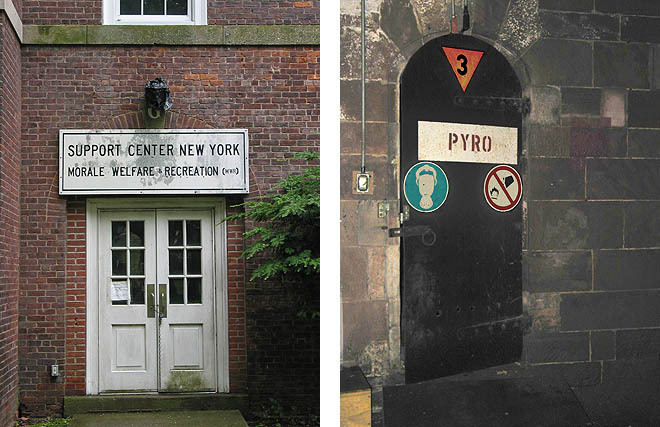 Neither facility ever saw any combat, although they were considered key defenses during the War of 1812 and the Civil War — a testament, we were told, to their deterrent power. Many of the doorways have signs that remind you that, no matter how quaint the buildings may be, the installation was once deadly serious business. The door on the left is from a collegiate brick building crawling with ivy, the right is the basement powder magazine from below Fort Jay. Getting to Governor’s Island is easy, and anyone can go and spend a relaxing day strolling the island (bikes are permitted, too). The ferries leave six times a day, and they’re free. Once on the island, you’re free to roam around most of the historic area, but to see some of the more interesting parts you have to take a tour with a guide. The entire southern part of the island is currently off-limits. While the historic area of the island will remain a protected federal landmark, formal ownership of Governor’s Island was returned to New York from the federal government in 2003. The future of the island is in flux, but there are many proposals being considered. The opportunity is attracting some big names, too, including the always-surprising Manuel Calatrava who has proposed a striking — if somewhat unlikely (okay, kinda crazy) — gondola transport bridge to access the island. Current proposals range from a residential community to a CUNY college campus. The college campus proposal is a no-brainer: a more idyllic place of learning cannot be imagined, with quad-like open spaces, august halls ready for hundreds of classrooms, military barracks that are a renovation away from being dormitories, stately mansions for college administrators and professors, and a short ferry ride to Manhattan and Brooklyn for adventurous students, yet seclusion from the hustle and bustle for students concerned with intensive focused learning. That plan has my vote. Next Next post: I am large, I contain multitudes. Wow – I’ve been to New York several times and I’ve never even heard of Governor’s Island! Surprising given how large it looks on the map. Lisa Kereszi and Andrew Moore showed a series of haunting photographs documenting this tiny city in an essay aptly titled: Governors Island. Much like your work, the images document a society that once was. Jeff: The photos in that essay are collected in a book that was for sale in the bookstore on Governor’s Island (a nice little store, by the way, for NYC history books and really nice maps). When we saw the book, all of us had just finished taking our own photos of the island. It was a little weird seeing a hardbound book full of essentially the same images that were sitting on our rolls of film and memory cards. Of course, the pics in the book are better than mine! sir: my husband is Lt. COl. John Jo Fahey USMC, nothing to do this morning so I typed this in search and came up with this article. As luck would have it his fathers family grew up in New york in the Redhook section. How funny is this. Am interested in hearing from you regarding these similarities…if you’d like to talk email me at above address, who knows perhaps we could be from the same line of faheys.